Last week Peter Lorenzen blogged about the Super Sunday event at the upcoming UKOUG 2013 Tech conference. One of the streams for that day is the WebLogic Hackathon. This stream is presented by an international lineup consisting of Simon Haslam, Peter Lorenzen, Jacco Landlust, Guido Schmutz, and Ronald van Luttikhuizen. Peter has prepared a lab where participants can perform a scripted installation and configuration of Oracle WebLogic Server 12c. I've prepared a follow-up lab in which we will do a similar installation and configuration, only this time fully automated using Puppet. 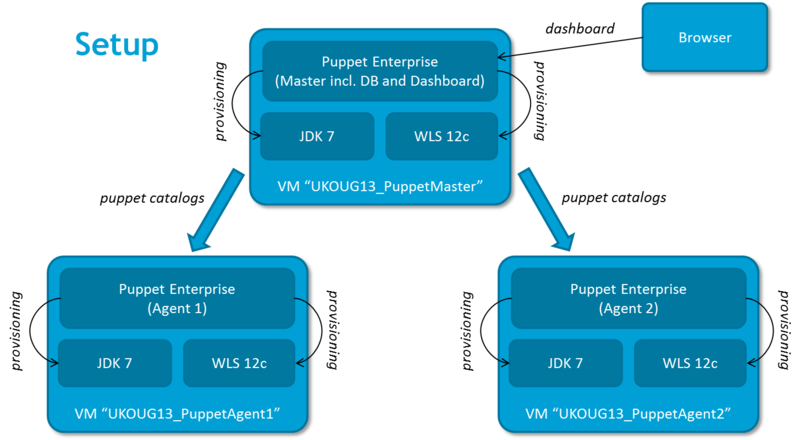 Puppet is a tool to automate configuration management. Together with Chef it's one of the more popular configuration management tools at the moment. Puppet allows you to describe the desired (to-be) state of your servers by declaring resources. These declarations can describe user accounts, security settings, packages, directories, files, executable statements, services, and so on. Manifests are the files in which resource declarations are listed. Puppet periodically applies manifests by translating manifests into specific commands (catalogs) and executes those on the managed servers. Puppet is capable of inspecting the machines so it only applies those changes that are necessary. If a machine is already in the desired state Puppet will apply no changes. The following example shows a simple manifest that can be used to install and configure the Network Time Protocol (NTP) service. The manifest declares that the "ntp" package needs to be present, that the ntp configuration file is copied to the right location, and that the ntp service is running. A change in the configuration file will restart the service. Manifests can be version controlled and managed the same way you manage other code. So, sign-up for the WebLogic Hackathon at UKOUG 2013 Tech and join us for this cool hands-on-lab !!! If you want to know more about Oracle WebLogic Server please visit Oracle Technology Network. If you want to know more about Puppet I strongly recommend the Puppet 3 Beginner's Guide by John Arundel. Also see Edwin Biemond's Oracle Puppet modules on Puppet Forge.